and on iTunes sometime after that. Stephenson is an author in her own right. Two decades of technical writing, web design and marketing for countless private clients and community groups led her to produce this nstructional series titled Just the FAQs, the ultimate user-friendly guides to the technical aspects of internet marketing and promotions. Her book is The Sage Age: Blending Science with Intuitive Wisdom, which was featured in Publishers Weekly shortly after its debut. The FAQs Podcasts feature informative interviews with industry professionals in the business of writing, marketing, and the creation of online media who will help writers create a top-notch product and help them reach their target audience. The two writers will do what both do best, that is give their listeners lots of tips and ideas based on their professional experience and practical approaches based on practical experience promoting their own books. Howard-Johnson instructs at UCLA Extension’s world renown Writers’ Program. Her first novel, This Is the Place, won eight awards. Her second book, Harkening: A Collection of Stories Remembered, creative nonfiction, won three. She is also an award-winning poet. 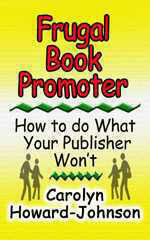 Her how-to book for writers, The Frugal Book Promoter: How to Do What Your Publisher Won’t is recommended reading for her classes, was named USA Book News’ “Best Professional Book” and is an Irwin Award winner. Her second book in the How To Do It Frugally series is The Frugal Editor: Put Your Best Book Forward to Avoid Humiliation and Ensure Success. It, too, is a USA Book News award-winner as well as the winner of the Reader View’s Literary Award. She is the recipient of both the California Legislature’s Woman of the Year in Arts and Entertainment Award and the Glendale American Business Women’s Association’s Woman of the Year award. Her community’s Character and Ethics Committee honored her for promoting tolerance with her writing. She was also named to Pasadena Weekly’s list of 14 “San Gabriel Valley women who make life happen.” She is a popular speaker and actor. Sassy, thank you for letting your many fants know about the feebies in my continuing search for ways to help writers frugally. (-: BTW, I went to become your twitter pal and found we already were. It's one of the bad things about Twitter (there aren't many! ); it's hard to keep up with all one's followers after a while. Next Entry NEW RELEASE: Looking for a cozy mystery?